Approved for Veterans Benefits, Chapter 30, 31, 33, 35, and the Military Spouse Program MyCAA. Please call NPTI’s California’s Certifying Official 1.800.460.0933 for more information. Attention Veterans: Please be advised this school location is qualified for BAH under our main facility code zip code 90401. Please check BAH calculator. San Diego can be a great place to be a personal trainer, so don’t wait another minute to enroll in the National Personal Training Institute in San Diego, CA. Our Pacific Beach location features highly skilled instructors and fantastic equipment. This intensive six-month program is like no other as you gain the hands-on experience in all aspects of physical fitness and weight training. You also spend part of your time in a classroom setting learning about human physiology, anatomy, nutrition, and how to create as well as tailor fitness programs for a wide variety of needs. NPTI prepares you for a successful career trajectory with immersion in the skills you will need to run your business and professionally interact with your clients in order to help them meet their fitness and health goals. We have a great payment plan to make tuition more manageable as well as student financing options. Upon graduation you will have a well-respected personal training diploma as well as CPR/ First Aid/ AED certifications. As a National Academy of Sports Medicine (NASM) partner, we prepare you to take the NASM-CPT exam. The National Personal Training Institute of Southern California’s partnership with NASM will give you an incredible hands-on education that will fully prepare you to enter the competitive job force. Graduates of NPTI will receive a Diploma as an Advanced Personal Trainer and will be eligible to sit for the NCCA accredited NASM Certification upon completion. This 500 hour course involves 200 hours at a gym training and 300 hours in the classroom. Get in great shape while you get the educational foundation to start your new career as a professional personal trainer at the National Personal Training Institute in San Diego, California. Includes books, online CPT materials, Diploma, NASM/CPT and CPR/AED Certifications. Monthly payment plan options and financing available. Only the Diploma Program is offered in California. No online or hybrid programs available. The NPTI Yoga Teacher Training (YTT) Program, is a 500 hour, (6 Month Course) immersing you in the ancient practice of Yoga. Using Yoga as a system to develop awareness of the self, body, energy and mind. NPTI is recognized by, and registered as a yoga school through Yoga Alliance, the largest nonprofit association representing the yoga community. 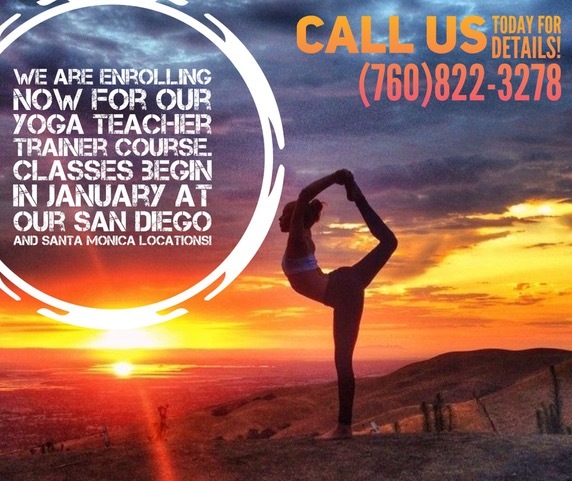 The program is designed with both classroom and practical applications to prepare you as a certified Yoga Instructor. As well as to enhance a personal training career, by incorporating its philosophy and practical techniques to better your clients’ goals. Prerequisite – None. *This course is approved by the VA (Chapters 30, 31, 33, 35 and the MyCAA spousal program are accepted). *Flexible, interest free, payment plans are available as well! Many of our International students have been able to use a B-2 Visa to attend our school as we are not a credit based college and our classes fall within the 18 hour per week visa restrictions. Please email our International Student Coordinator for more information on this exciting opportunity to get started today!